I've known about CafePress for years. I think it's a genius way of running a "user generated content" business. They handle all of the logistics, manufacturing, customer relations and finance. You provide the content. I think it's a model of how to leverage a core competency of manufacturing, and I'd love to see similar businesses in other areas. 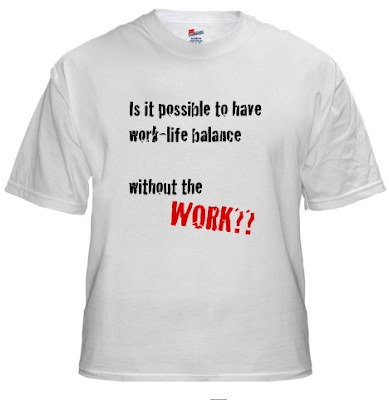 "Is it possible to have work-life balance without the work?" Overall the process is pretty smooth, although it was several hours of work to come up with a design, do all the Photoshop fiddling, make two version (depending on landscape or portrait mode), and then create the right sizes for each of the scores of items offered. I thought about taking silly things down (like the intimate underwear), but it was going to be more work to filter everything, and besides, maybe someone will want them. Overall, I was impressed with the process and big thumbs up to the CafePress team for putting together a great site. I'll track the performance over the next few months, but if you are interested, or know of some soul run over by the train wreck of this economy who might be cheered up, be sure to purchase something and I'll let people know how it turned out. This weekend I came across the ultimate in mixed branding - the Hybrid Escalade. With a hybrid option to the standard Cadillac Escalade, it is now possible to eek out an astonishing 20 MPG out of this 8 passenger transport. With a base price of $74k (as opposed to the base of $63k for the regular Escalade) this might master from Detroit certainly targets the upper income range for car purchasers. From a fuel consumption point of view, the improvement, as I understand it, is somewhere from 14mpg to 20mpg - or about 6mpg. At 15,000 miles/year, this is 321 gallons/year savings. At $3/gallon, that's $963/year, which would probably not make this justify the price premium. But the real question is: does the "Hybrid" badge do anything, from a marketing point of view? Most hybrids have a halo effect (and, if you can drive in the carpool lane, a time-saving benefit as well). With the MANY "Hybrid" badges plastered on this vehicle, clearly the hybridization matters, but reaction from many indicates that this vehicle is more one of amazement and scorn. 60 Minutes recently ran a very interesting story about Nuclear Fusion. While the science of the video is very thin (hey, they only had 12 minutes!) the clear story is that it is slowly becoming acceptable to work on nuclear fusion technologies. Recently I spoke with the CEO of General Fusion, a Vancouver based company. The founders come from CREO, a company with impressive technical pedigree, and they are working on an interesting fusion concept, shown here. Basically, as I understand it, they have a spherical container with many pneumatic rams. The rams all fire simultaneously, creating a spherical shockwave that implodes upon itself. At the center of the sphere, the wave collapses, creating astronomical pressures, and fusion. Unlike many crackpot energy stories I hear involving perpetual motion machines, what intrigues me about nuclear fusion is that it actually works. It's just that the engineering is really, really hard. However, the difference between "really hard" and "impossible" is non-trivial. So, I for one remain interested in this space. However, I don't know if it is going to be always decades away. I hope not, however, I'd welcome others' comments on viability and practicality.